My boyfriend stopped in a new place for lunch last week and was quite taken with a panini he'd ordered. It had chicken, red onion, chipotle sauce, and mozzarella cheese. This weekend, we decided to try to make it on our own. We got whole wheat flatbread, mozzerella, and chipotle peppers. The BF had everything else at home. He sliced the mozz and onion, I shredded the chicken he'd cooked from a previous evening. The best part of it was our homemade chipotle mayo. The BF took two whole chipotle peppers, about a half-tablespoon of sauce, and half a cup of light mayo (there was a lot left over from this particular batch). It all went in his trusty Magic Bullet, and in a minute, we had chipotle mayo! I couldn't stop sneaking nibbles with bits of chicken that I'd dip into the mayo (don't worry--NO double-dipping). I've never been a huge mayo fan, but I could see myself making this at home quite often. I'd made chipotle sour cream before, but this was new for me. Chipotle, as many of my friends know, is one of my favorite flavors. I love it in Tabasco, mashed potatoes, sauces, sour creams, you name it. If I see chipotle on a menu, I'm quite likely to order it. I like the smoky heat it provides, which is not the searing, often tear-inducing pain a raw jalapeno or serrano or other hot pepper will provide. 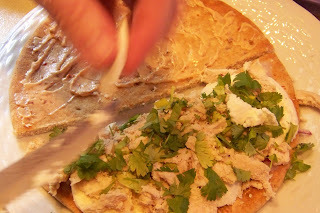 We spread a thin layer of the chipotle mayo (little goes a long way, compadres), then layered the red onion, mozzerella, chicken, and a hefty dose of fresh cilantro before sealing it all up. 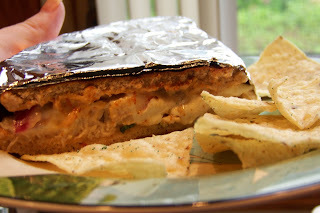 We decided to make just one panini and split it, you know, test the proverbial waters. We coated the panini with a light brushing of olive oil and got to cookin'.I'd never made a panini before, so it was a lot of fun for me to get to flip the (very heavy) panini press, which went right over the gas burner. In a matter of minutes, the cheese was bubbling, oozing over the edges, and the top of the flatbread was a nice dark brown. We took it off the heat, the BF sliced it, and we sat down to taste the fruits of our labor. Que sabroso! It was quite tasty. I wasn't sure what I'd think of both red onions and chipotle, but they paired perfectly. The sharpness of the red onion got a nice smoothing out by the smoky heat of the chipotle mayo. 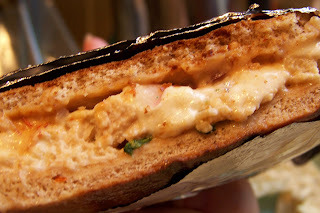 I'm now going to make this a new staple for my pantry--chipotle mayo year-round!